Many investors, including Paul Tudor Jones or Stan Druckenmiller, have been saying for a while now that the current market is overvalued due to a low interest rate environment that leads to companies swapping their equity for debt and focusing mostly on short-term performance such as beating the quarterly earnings estimates. In the fourth quarter, many investors lost money due to unpredictable events such as the sudden increase in long-term interest rates and unintended consequences of the trade war with China. Nevertheless, many of the stocks that tanked in the third quarter still sport strong fundamentals and their decline was more related to the general market sentiment rather than their individual performance and hedge funds kept their bullish stance. In this article we will find out how hedge fund sentiment to Univar Inc (NYSE:UNVR) changed recently. Univar Inc (NYSE:UNVR) shares haven’t seen a lot of action during the third quarter. Overall, hedge fund sentiment was unchanged. The stock was in 33 hedge funds’ portfolios at the end of September, which wasn’t close enough to make it as on of the 30 most popular stocks among hedge funds in Q3 of 2018. The level and the change in hedge fund popularity aren’t the only variables you need to analyze to decipher hedge funds’ perspectives. A stock may witness a boost in popularity but it may still be less popular than similarly priced stocks. That’s why at the end of this article we will examine companies such as 2U Inc (NASDAQ:TWOU), ONE Gas Inc (NYSE:OGS), and Pluralsight, Inc. (NASDAQ:PS) to gather more data points. “Univar Inc., which distributes chemicals, announced a definitive agreement to acquire Nexeo Solutions, a global chemicals and plastic distributor, in a stock and cash deal valued at roughly $2 billion. We believed this transaction could add significant value for Univar shareholders due to the synergies and scale that it created. We were comfortable with the valuation Univar paid.” – This is what First Eagle Fund of America said this about the company in its recent Q3 Commentary. In the 21st century investor’s toolkit there are several methods market participants put to use to analyze stocks. A duo of the most underrated methods are hedge fund and insider trading moves. We have shown that, historically, those who follow the top picks of the top hedge fund managers can outclass their index-focused peers by a significant amount (see the details here). Let’s analyze the fresh hedge fund action surrounding Univar Inc (NYSE:UNVR). How have hedgies been trading Univar Inc (NYSE:UNVR)? At the end of the third quarter, a total of 33 of the hedge funds tracked by Insider Monkey held long positions in this stock, same as in the previous quarter. 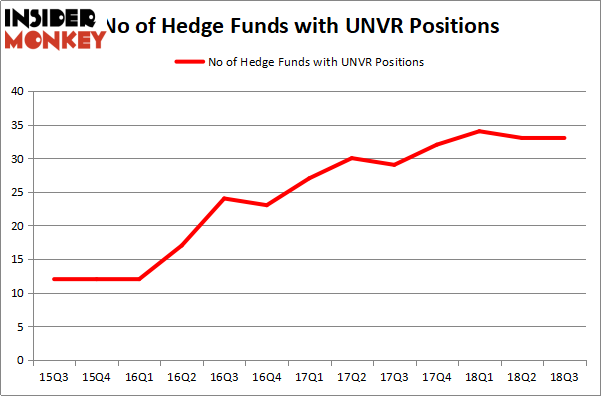 Below, you can check out the change in hedge fund sentiment towards UNVR over the last 13 quarters. With hedgies’ capital changing hands, there exists a few notable hedge fund managers who were upping their holdings significantly (or already accumulated large positions). Among these funds, Iridian Asset Management held the most valuable stake in Univar Inc (NYSE:UNVR), which was worth $259.1 million at the end of the third quarter. On the second spot was Valinor Management LLC which amassed $95.3 million worth of shares. Moreover, Baupost Group, Marcato Capital Management, and Park Presidio Capital were also bullish on Univar Inc (NYSE:UNVR), allocating a large percentage of their portfolios to this stock. Due to the fact that Univar Inc (NYSE:UNVR) has experienced bearish sentiment from the aggregate hedge fund industry, we can see that there exists a select few funds that slashed their positions entirely in the third quarter. Intriguingly, Patrick Degorce’s Theleme Partners dropped the largest investment of all the hedgies tracked by Insider Monkey, worth an estimated $34.1 million in stock, and Matthew Iorio’s White Elm Capital was right behind this move, as the fund dropped about $14.2 million worth. These transactions are intriguing to say the least, as total hedge fund interest stayed the same (this is a bearish signal in our experience). 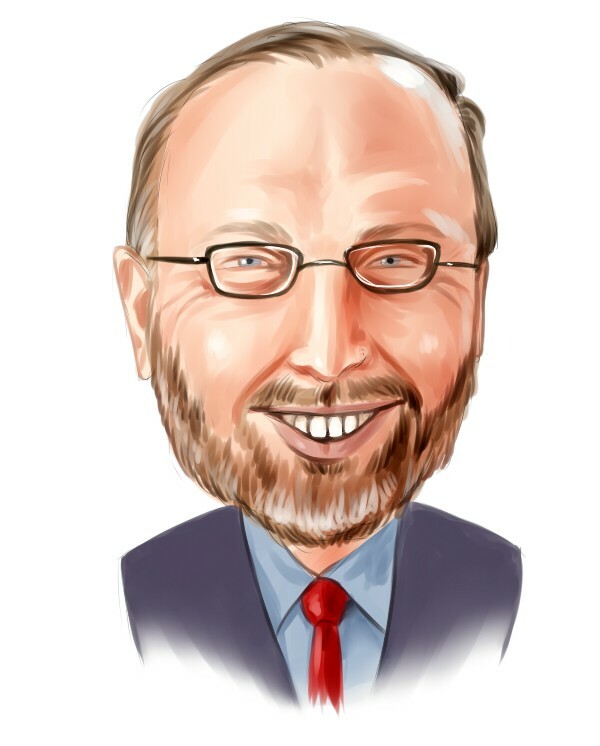 Let’s go over hedge fund activity in other stocks – not necessarily in the same industry as Univar Inc (NYSE:UNVR) but similarly valued. These stocks are 2U Inc (NASDAQ:TWOU), ONE Gas Inc (NYSE:OGS), Pluralsight, Inc. (NASDAQ:PS), and Wyndham Destinations, Inc. (NYSE:). All of these stocks’ market caps are closest to UNVR’s market cap. As you can see these stocks had an average of 16 hedge funds with bullish positions and the average amount invested in these stocks was $238 million. That figure was $854 million in UNVR’s case. Wyndham Destinations, Inc. (NYSE:WYND) is the most popular stock in this table. On the other hand Pluralsight, Inc. (NASDAQ:PS) is the least popular one with only 13 bullish hedge fund positions. Compared to these stocks Univar Inc (NYSE:UNVR) is more popular among hedge funds. Considering that hedge funds are fond of this stock in relation to its market cap peers, it may be a good idea to analyze it in detail and potentially include it in your portfolio.